This week we have been investigating the colour spectrum of light - aka making rainbows with plant misters. All you need is a plant mister, some water and a sunny day. 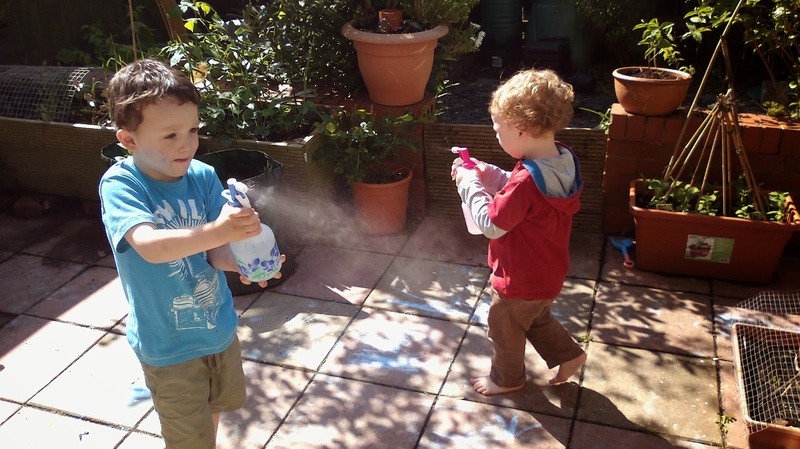 Start your little one off spraying in any direction, then guide them to rotate themselves very slowly while spraying and keep looking down onto the spray until they start to see the rainbow forming. At this point you can tell them that light is made up of all the colours of the rainbow mixed up to make white light and that the drops of water in the mist make the light separate out into the individual colours. You can take it further by making rainbow collage pictures or painting with the colours in the correct sequence. I am also a geek and have always sung the rainbow song using the correct colours of the spectrum of light rather than the traditional words. Red, orange, yellow, green, blue, indigo and violet slip into the song fine when you've got used to it. There are various mnemonics to remember the colour spectrum of light, but why not make up your own with your kids so that it's relevant to them and they will remember it. The is also a fab song on the Here Comes Science album by They Might Be Giants about Roy G.Biv, a mystical man who lives in rainbows. We have this album on constantly in the car because Ollie moans if we try to swap it for something else, so it's just as well we like it too. Thank goodness it took over from 'the wheels on the bus'.